When most people think of branding, content isn’t usually the first thing that comes to mind. They typically think of logos, color schemes and taglines – those elements that are used to represent a company in their online and offline marketing collateral. In the age of content marketing, however, content can be a powerful tool for branding your company. 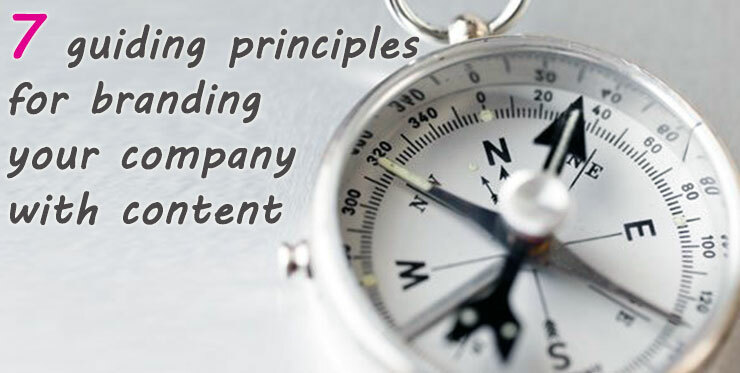 This post will look at seven things every CMO should know about branding their company through their content. 1. Branding your company with content isn’t branded content. First, it’s important to differentiate between branded content and branding with content. There are a multitude of definitions when it comes to branded content, but I’ll take a shot at my own: it’s any content that is used in place of traditional advertising mediums. It can take many different forms, but some of the most common are advertorials, product placements and sponsored posts. While all business content will be (and should be) branded in some way, generally speaking, this branding should be subtle and should never detract from the main message of the content. Content can be created in one of two ways: either with the primary mindset of attracting visitors, links and shares (and ultimately, sales), or from the mindset of helping. To truly help, your content needs to meet the needs, interests and pain points of your audience. If you want your content marketing to be as effective as possible, nurture an environment of caring. Make sure your content team understands and cares about the needs of your target market, and that this care is reflected in all the content that’s produced and shared. 3. The team must understand your brand values. A preferable definition, in my opinion, is this: branding is how you decide to present your company to your target market. What do you want people to think of when they think of your company? All the content you produce — whether that’s social media content, email content or website content — should help paint a picture of the idea and quality of your brand. This means ensuring that every person who creates, curates, edits or distributes your content needs to understand exactly how you want your brand represented online. 4. Determine your brand’s value statement. This takes my last point a bit further. In order to maintain consistency in your content, each person who’s involved in your content management needs to know how you want your brand represented. One of the simplest and most effective ways to ensure this happens is to have a brand value statement. What do you want your brand to stand for? Summarize this in one sentence or less. What problem do you help people solve? For instance, a contractor may have a value statement like, “We help home owners accomplish home renovations quickly and affordably.” This statement can and should be top-of-mind whenever content is created or promoted in order to ensure it’s always contributing to the bigger picture. Each piece of content that’s created can then be judged in light of this statement. 5. Your content can be your brand. Content is a powerful tool for building your brand. But did you know that your content can actually be your brand? Part of the way people perceive your company? Take Hubspot, for instance. When you think of Hubspot, what’s the first thing that comes to mind? Do you think about their inbound marketing software, and how well their blog posts, guides and ebooks promote that? No…more than likely, you think of the content itself. Hubspot invests heavily in content creation. They produce some of the most authoritative marketing content online. For this reason, when you think of Hubspot, you may very well think of content. Hubspot iscontent. This model can work in any niche or industry. By consistently creating and promoting extremely relevant content to your audience, your brand can also become synonymous with useful content. 6. Who writes your content is as important as the content itself. Are you more likely to consume content written by someone you’ve never heard of, or someone you already know and trust? I find companies don’t pay enough attention to who writes their content; and therefore, whose personal brand is influencing their own company brand. When I stamp my personal “John Rampton Brand” on something, it gets a lot more attention then your average writer because I’ve built a following and a name for myself. Your team should do the same. Are your blog posts written by an array of freelance writers? Do you regularly rely on guest contributions? Or are you helping to build the personal brands of key figures in your organization? Most businesses will never have the luxury of having a Neil Patel (Quick Sprout) or Brian Clark (Copyblogger) write for their company, but that’s ok. Invest in the personal branding of your writer(s) to help build your own brand. 7. Don’t give your brand center stage in your content. There’s no way around it: you are creating content to promote your product or services. But that doesn’t mean your content should be about your products or services. There are types of content where this will obviously be the case – a sales page, for instance. Generally speaking, however, your content should first and foremost speak to a significant problem or issue your target marketing is struggling with. It should provide insights or entertainment, no strings attached. Branding your content to an extent is fine; you do want that content to be associated with your company, and to help build your brand. An author bio, a logo on an image or a subtle reference to your brand are all expected. However, wherever possible, make sure the message of your content always speaks louder than your branding elements. Content marketing works best when you have a crystal clear idea of how your content is helping to build your brand. Rather than creating content as an afterthought or add-on strategy, use your content to perpetuate and strengthen your company’s values, and to become known as an organization that truly meets the needs of its audience.